On the Main Line: On Ohev Ger, part II. Yesterday I wrote a post about the book Ohev Ger by Samuel David Luzzatto, an introduction to and exploration of Targum Onkelos the Torah, the translation which can probably be spoken of as the official version of Rabbinic Judaism. The post contained a translated excerpt, about the proselyte Onkelos himself, with Shadal's reconstruction of his motivation for making the translation and. Today I would like to continue discussing the book. Shadal writes that the genesis of this book, which he wrote when he was about 29 years old, came from a few quarters which all converged and inspired in him a love for this Targum, and to study it very seriously and produce this introduction to it. As a child his hobby was to poke around in genizas, or dusty repositories of old, discarded books. As amazing as this seems to us (or to me), in the 1810s in Italy, people would still have 500 year old books and manuscripts, not know or care what they were, and basically throw them out (respectfully, of course, but its all the same). In the course of his excursions he found some real gems, a manuscript of the Talmudic dictionary Aruch, for example. Another thing he found was a manuscript written in the year 5211 (=1451) containing an unknown commentary to Targum Onqelos. Even though he was a precocious 12 or 13 year old to be interested in looking for such things, he didn't really examine it very seriously until many years later. In the meantime, through his own studies, he grew to love this Targum and felt that he had identified many methods used by the translator. In the book, he enumerates four general categories, which he further subdivides into eight, making 32 "paths" or principles that the translator followed, with examples of course. Parenthetically I would state that I don't think he really meant to say that there were literally 32, and exactly 32, principles used by the translator. That's too convenient, kind of like Malbim's enumeration of 613 principles of exegesis used by the Sages. Leviticus 1:16 reads אל מקום הדשן, "in the place of the ashes." Onkelos translates לאתר דמקדין קטמא, or "in the place where they burn the ashes," which contradicts rabbinic literature, and frankly hardly makes sense. So Jeiteles asked if readers would suggest an explanation. What it says is that Shadal told him that he found that in the 1491 Lisbon edition of the Chumash he found a reading דמושדין, or "the place where they throw out the ashes." Furthermore, the Christian scholar Samuel Le Clerce [sic; see below] brought this variant in a collection of variant readings. To Shadal this seems correct, and Jeiteles too was satisfied. In Ohev Ger Shadal expands more fully on this inspirational episode. He writes that the Targum is full of mistakes, and therefore one of his goals in the book will be to catalog variants and apparent errors. He knows that many a reader will want to know, who told him there are mistakes? I have always read it, the reader will think, and never noticed any. So he explains that he too never realized it until the following occurred. 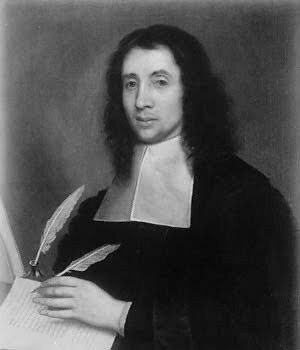 Shadal writes that Jeiteles' question appeared, and he remembered his manuscript of the unknown Targum commentary, which he had not looked at in 12 years. He looked inside it and saw that instead of the word דמוקדין it had דמוקרין, which might means something like "where they store as valuable, the ashes," (unless it means "cooled," from קרר.) He was not fully pleased with this reading, but it was something. Then he asked some local scholars what they thought, and his friend and former teacher, Meir Randegger, told him that he had seen in an incunabulum, the Torah edition published in Lisbon in 1491 that it said דמושדין, "the place where they throw out the ashes" (you can read it here, pg. 3 - how about that?). This is what he sent to Jeiteles. He asked Randegger to lend him the volume, and he compared it with other editions and discovered more than 1000 different readings from other versions. In his manuscript (which he named Yaer, after the numerical value of 211, its year of composition) he noted another 365 differences from other versions. Then he looked in other books, including editions of Ramban and Rashi, and noticed more variants. To say he was surprised is an understatement. Who knew that the text of the Targum was full of so many mistakes? In Ohev Ger he writes that this was a real shock to him, particularly because the Targum Onkelos is such a classic Jewish text, complete with a religious obligation to peruse it every week. So he decided that in addition to explaining the methods of this Targum, he was also obliged to study the text itself, and catalog its variant readings. In discussing variants, Shadal feels he must explain how it is that such an honored text would even have variants in the first place. He assigns it two reasons. The first is that the text was originally oral, and in itself that condition will produce variants, which also happens to all written books. These are not surprising and no big matter. But the second reason is variants which were introduced intentionally. In his opinion, many copyists deliberately changed the text all because they did not understand it properly since they did not know Onkelos's methods. So sometimes they would notice a discrepancy between the text and the Torah, and not realizing that it was intentional would assume that they had an erroneous text in front of them and try to correct it. He gives a couple of examples to substantiate this. In the old world of scholarship, Europeans didn't care very much for their given names, so they would generally Latinize them for appearance in print. This in turn gave other scholars the license to translate, as it were, these Latin names into another European vernacular. So with a name like Samuel Le Clerc, you'd think this was a Frenchman. But actually he was English. His work Variae Lectiones et Observationes in Chaldaicam Paraphrasin was signed Samuel Clericus. When he took his wig off and kicked up his feet, he was called Samuel Clarke (1625-1669). In the course of Shadal's initial introduction he gives due to the one earlier scholar who showed great esteem for Onkelos, citing Maimonides as the first to speak of it in very laudatory terms in his Guide to the Perplexed. He agrees that Rashi and Ramban also made great use of it, but they did so only incidentally, either as support for their view, or to refute the Targum's interpretation. However, Shadal feels that even the Rambam did not give Onkelos his due, since his praise only came from his approval of the way in which Onkelos weakens anthropomorphism. 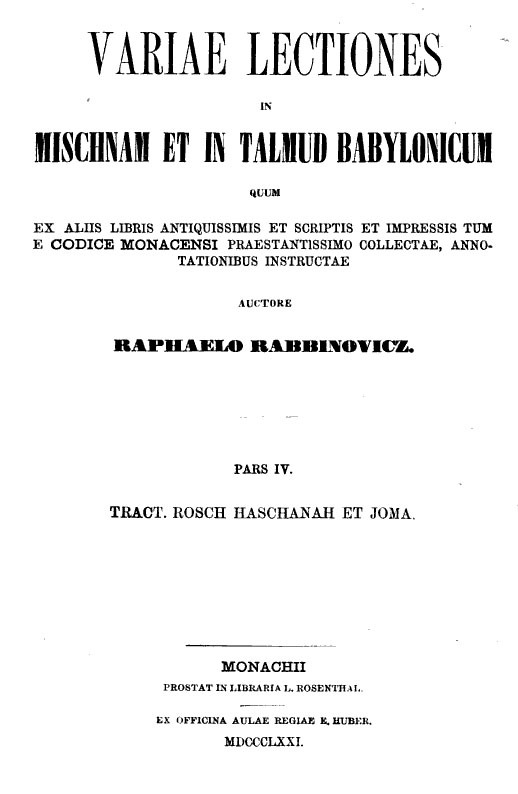 He finds it altogether strange that no single commentary on Onkelos exists, while the rest of rabbinic literature has commentary upon commentary. He closes his introduction by noting that Jeiteles was really the expert, and is said to have written a work called Kanfei Yonah (The Wings of a Dove; Yonah being a reference to his father, Dr. Jonas Jeiteles). So in case the reader is wondering why he, younger and inferior, is presuming to publish his work first, it is only because Jeiteles has thus far not published his. Perhaps, speculates Shadal, Kanfei Yonah is very exhaustive, whereas his little book is concise, and that explains the failure of the book to appear in print. Naturally we cannot end here, but must give some examples from his 32 paths. Shadal is naturally concerned with deviations in straight translation, since normal translation is hardly a "principle" requiring explanation. He divides these deviations into four kinds. 1. Where the Targum changes the language of the text, but the meaning is retained. 2. Where both the language and meaning is changed. 3. Where the meaning of the text is retained, but something additional was added. 4. Where the meaning was changed, and something was added. He supplies many examples for each of these four classes, and divides these examples into eight parts, each one having a common thread. This common thread is, he believes, the reason for the specific translation choice. So, for example, the first category, that the language is changed, but the meaning is retained. Here are two examples: Gen. 1:14 says "yehi or," (let there be light) which is singular. The Targum reads "yehon nehorin," (let there be lights), which is plural. Another example is Gen. 7:2, where the Torah says "ish ve-ishto," (literally "[each animal pair,] man and wife"). Onkelos writes "dechar ve-nekuva," which means "male and female." So the text is changed, but not the meaning. Shadal assigns such translation choices to idiomatic difference between Hebrew and Aramaic. Another path in this category is interesting because he differs with Maimonides, who was of the opinion that Onkelos removes the anthropomorphisms in the Torah, so that people will realize that God is totally incorporeal. Shadal agrees that many anthropomorphic expressions are changed, but he points out that many are not changed at all (e.g., God still "speaks," has a "hand" and "sees" in the Targum). So his belief is that Onkelos deviates from literal translation where the anthropomorphism poses the danger of lessening God's dignity in the eyes of readers. Obvious examples are Gen. 8:21 "va-yarach yhwh es re'ach hanichoach," (and the Lord smelled the sweer savour), which Onkelos translates as "vekabel yy beraava yas kurbeneh," (and God accepted the sacrifice). He makes some very subtle and sharp observations, such as that whenever the Torah speaks of God "remembering" something, in Onkelos it is always given in the present tense, even if in the Torah it was written past or future tense. In Shadal's view, this is because the idea of God remembering something past or future implies an undignified situation of temporary forgetting. Some months ago the עלים לתרופה, a Belzer parsha sheet widely distributed in Israel, Europe and the United States included in its biographical column יומא דנשמתא a biography of my favorite Victorian rabbi, הגאון הצדיק רבי נתן הכהן אדלר זצ"ל רב הקולל של לונדון-בעל נתינה לגר, Nathan Marcus Adler. His piety and scholarship should of course remain unquestioned (even if Rabbi Adler "pleads guilty to an occasional novel" [link]). The article quotes Rabbi Adler that the Targum Onkelos was written by the proselyte "with wisdom, according to tradition, etc. . . but not like the view of some scholars who are of the view that the Targum was written for the plain people, and not the scholars. Actually it was written for all the people, plain and scholars alike . . ." This opinion is supported and demonstrated by Rabbi Adler in his commentary. 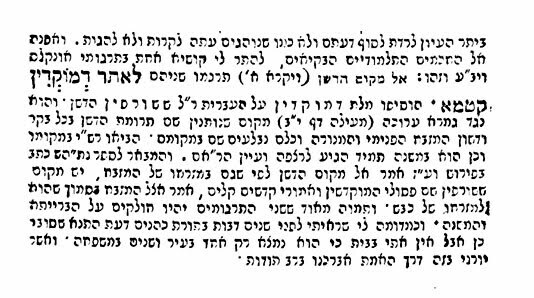 The footnote in עלים לתרופה (correctly) notes that the opinion he meant to counter was Samuel David Luzzatto's in his Ohev Ger (Vienna 1830) that the Targum's primary audience was the plain people (הדיוטות) and not the scholars. Various consequences follow from the respective opinions. But the footnote must write a little editorial appelation which I am confident that Rabbi Adler would have been quite upset to read: בכך יצא חוצץ נגד המשכיל האיטלקי שד"ל שר"י שחיבר ביור משלו על תרגום אונקלוס בשם אוהב גר בו פוער פה כאילו התרגום נועד לפשוטי העם. The idea is presented here as if it's some grievous outrage, as opposed to a carefully reasoned scholarly hypothesis. Furthermore, Rabbi Adler's view is framed as a response to a grievous outrage, rather than a gentleman's disagreement on scholarly grounds. In fact Rabbi Adler had nothing but respect for Shadal. So far I have described two paths in the first category. One more: this one is that Onkelos changes the text (but retains the meaning) where the honor of Israel is concerned. An example is Gen. 31:19, where the text says "va-tignov Rachel es ha-terafim," (and Rachel stole the terafim), but Onkelos says "unesivas," that she took it. Another example is Gen. 34:13, where the sons of Jacob answer Shechem and Chamor "be-mirmah," (with deceit) and Onkelos reads "be-chukhma," (with wisdom). I will give one example for each of the next three paths. The second category is to change both the term and meaning. Here again he has eight categories, one of which is to accord with the Oral Law, that is, the rabbinic explanations. Two examples of this are Gen. 24:63 "lasuach basadeh, (to meditate in the field) while Onkelos has "letzalaah ve-chalka," which means "to pray in the field." This accords with the rabbinic teaching that the Patriarchs each prayed one of the three daily prayers that are part of the daily Jewish routine, and that Isaac was in fact praying Mincha in this verse. The fourth is where the meaning was changed, as well as the text. My example is the path where these kinds of changes are made for the honor of Israel and our ancestors. See Deut. 32:6 "am naval ve-lo chacham," (O foolish people, and unwise.) Here Onkelos reads "ama de-kabilu oraysa ve-la chachimu," (A nation which received the Torah but has not become wise). Note that this was 1839. In the second edition it had a German title, Schrift und Tradition, rather than the Latin Scriptura ac Traditio. 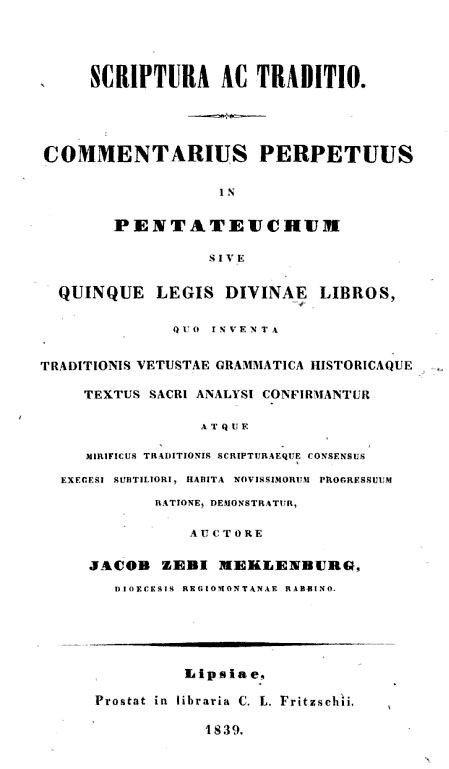 Possibly this reflects a change in the status of Latin as the language of scholarship (which, in truth, was already no longer the case in 1839). To continue, the book contains a great deal of other interesting tangents. For example, Shadal discovered that the Syriac language is very helpful for elucidating Aramaic, so he tries to make the Jewish reader aware that such a language exists, and to supply examples where it can help one to understand the Targum. In the course of his discussion on Syriac he makes the interesting observation that in the Syriac dialect there is a parallel to the Ashkenazic/ Sephardic pronunciation of the kamatz. Eastern and Western Syrians are also split between those who pronounce kamatz words with O and those who pronounce with A.The upshot is that this is a legitimate dialectical variant. Getting back to the question of the true reading of the Targum to Lev. 1:16, I'm sure some would like to know more. About the title: at the time Shadal was writing this book, his wife conceived and when their son was born he named this baby Ohev Ger, which is certainly an unusual name. Thus began a custom, which I happen to think is quite charming, which was that he named almost all of his many children after works that he was intensely involved with at the time of their birth. Thus, for example, when he was writing a commentary to Isaiah, he names his child Isaiah. When he was working on the book of Job, he named the son born at the time Baruch Iyov. 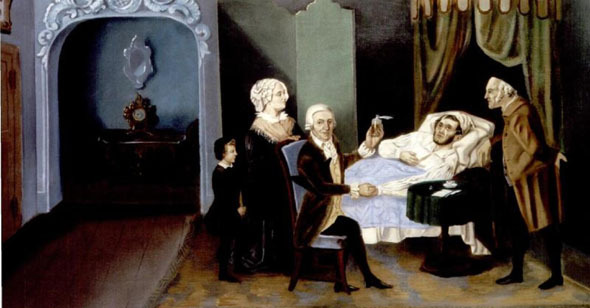 Ohev Ger Luzzatto (1829-1854) also had an Italian name, which was Filosseno, which without knowing Latin or Italian one can plainly see is cognate with Philoxene (Philo=love xene=stranger). Translated by you, with knowledge and sense. But considers your words a crown upon his head. Some expressed interest at another post discussing Onkelos, authorship, etc. That's a good idea. So there will be a third post to come. Like this one, I will give priority to Shadal's view (because I like him and they're interesting, not so much because I think they're cutting edge and fully historical). If you're interested to know where Clericus's Targum variations can be found in the Walton Polyglot, the place to look is in the Early English Books Online collection, title "Biblia sacra polyglotta" reel #1169, and it begins on page 511 of 928. Rereading that, it looks like Syriac suduko, but I guess whoever needs to know will understand. Fascinating. The two posts in this series have been very educational. I thought of that connection between Shadal and Xenophilius Lovegood a while ago. I think JK blew that one. "Xeno" is a reference to the stranger, the immigrant. Lovegood is into the strange, the weird. I don't think that's the connotation of the Latin term. DF, that was an editing mistake. In writing the post I approached it from like four different directions, and piecing it together was a challenge. At the end I was planning on writing about the the correct nusach, but decided that it's not so important, and besides, no one knows. 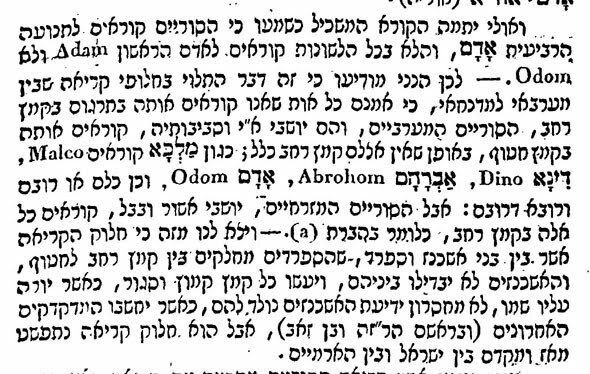 It may be of interest to some that Artscroll has דמושדין, which as we can see here, was absolutely rare in 1830. If anyone is interested in what the Yaer manuscript says, see Chumash Toras Elohim with Nesina La-ger, page 299. Adderabbi, I think I read somewhere that many of her names came from tomb inscriptions. Could be that she chose the name because it was real, even if not exactly what it should have meant. On the other hand, I don't think she's exactly a Latin scholar. Zohar, I doubt whoever wrote that in Alim Li-terufa read Ohev Ger. Anyone who reads it could not think that it was some kind of irreligious diatribe. J. K. Rowling does have a degree in classics, I believe. University of Exeter, I think. Then I take back my baseless slander of her. Thanks. A success? Was that a reference to the fact that she already is one, or to my username? The former. It was my lame idea of a joke (give a beracha when you falsely accuse someone). I heard you like comments. Do you have PX in original printed matter form or did you get it from hebrewbooks? Incidentally, I found it interesting that the Lisbon 1491 Chumash called the parshah after Vayikra "צו את". Do we know when the names of the parshios as we know them were invented? As far as I can remember, Rashi quotes the first distinct phrase of a parshah, but not necessarily the Standard Title. What, if anything, did printing have to do with that? Oh, and one more thing: In the Ode to Onkelos, 5-6th line, shouldn't it say דירי ארעא כלא חשיב, not כלה? I don't think he was cruel for the name - although I have never proved this to my satisfaction, I am reasonably sure at this point that the Italian Jews used their Italian names, except when called to the Torah, or in Hebrew writings and the like (just like their heimishe brethren, who used their Deutsch names, except when called to the Torah). Thus, Ohev Ger was really called Filosseno on a daily basis. I do have Ohev Ger in the original, but these excerpts are from hbooks, which is easy since it's online and requires no scanning. There's also at least two versions on Google Books (and the 2nd edition is on hbooks as well). I never looked into the names of the sidros, but it's an interesting question. Good catch about the poem. It could be a typo or *gasp* a mistake of the author, but it also might be correct, the way such things alternate in Aramaic. I looked in Jastrow, and it seems like there's no difference. I've been looking for a while for Peirush Shadal al haTorah. It's a shame that nowadays every likut or Pidyon Peter Chamor kaHalacha book gets published almost before the cheap BIC ink dries on the looseleaf paper, while the good stuff languishes in Google Limbo. But that's a complaint for another day. How common a name was Filosseno? Speaking of parsha names, have you ever seen literature calling the parsha* after Tazria -Tahara? I've seen it, but don't remember where. *I refuse to use the word sidrah. Gabbe, here is a link to Peirush Shadal al haTorah online: http://www.tora.us.fm/tnk1/jdl/index.html. Caution: this is a reproduction of the 1965 Schlesinger edition, which unfortunately omits or alters many of Shadal's references to non-Jewish sources. I think the intact original version is also available online, but I can't recall where at this late hour of the night. S., can you help? Shadal's earlier, much more concise perush, "Ha-Mishtadel," is available in the original at http://books.google.com/books?id=2q9WAAAAMAAJ&printsec=frontcover&dq=inauthor:luzzatto&lr=&as_brr=4&ei=gLZgS7i8HZC-zgTWnpybCQ&cd=53#v=onepage&q=&f=false. Oddly, the pages appear in reverse order; apparently it was scanned as if it were an English book. Finally, there is available for sale online (and in hard copy in some nice university libraries) "The Book of Genesis: A Commentary by Shadal," a complete English version of Shadal's Italian translation and Hebrew perush on Bereshit, by someone named Daniel A. Klein. This translator is currently working on Shadal's Shemot but probably has a few more years left before he can complete it (he should live so long, amen). Gabbe, I can't say how common a name "Filosseno" ever was in Italy, but Philoxenus was an established classic Greek name -- Shadal certainly didn't make it up. Wikipedia lists several prominent gentlemen named Philoxenus, including a Syriac scholar (Shadal probably knew this), a king, a general, a painter, and even a "legendary glutton." Last night I posted links here to Shadal's Perush al Ha-Torah online, but the post vanished. Here's the link: http://www.tora.us.fm/tnk1/jdl/index.html. Be aware, however, that this gives you the 1965 edition which omits or alters many of Shadal's references to non-Jewish sources. I think the complete, original version is also online, but I can't remember how to access it. S., can you help? There is also Shadal's briefer early perush, Ha-Mishtadel, at http://books.google.com/books?id=2q9WAAAAMAAJ&printsec=frontcover&dq=inauthor:luzzatto&lr=&as_brr=4&ei=gLZgS7i8HZC-zgTWnpybCQ&cd=53#v=onepage&q=&f=false. It's posted backwards, probably having been scanned as if it were an English book. And available for purchase online is "The Book of Genesis: A Commentary by Shadal (S.D. Luzzatto)," a complete English version of Shadal's Italian translation and Hebrew perush on Bereshit, by a certain Daniel A. Klein. This translator is currently working on Shadal's Shemot but will probably need a few more years to complete it (he should live so long, amen). What language is that?? Pun on קלל? "Kela chashivin" is spelled with hei in the source quote, Daniel 4:32. Hi, thanks for this fascinating post! A full online scan, downloadable, of Targum Onkelos in the Yemenite tradition, from an old (public domain) edition. A scan of a full Taj including the Targum would also be fine, as long as it is out of copyright. Does anyone know of something like this? Can't find one at JNUL or at hebrewbooks.org. I, too, wikipedia-ed Philoxenus, but as you can see all of these people were long dead before little Ohev-Gerele Luzzatto was thought of. I'm curious about how much he was teased in cheider.